Sometimes known as the ‘Mountain Blackbird’. It is a summer visitor to Bowland but recently their numbers have declined. In the early nineties, around 35 pairs regularly bred but this had plummeted to just 10 occupied territories in 2006, a decline of around 70%. The reasons for the decline are yet to be ascertained but climate change affecting the availability of food sources such as earthworms is likely to be a major factor. It breeds in moorland and mountainous areas especially around rocky cloughs or outcrops. The bold white breast crescent of the male, duller and browner in the female, is the best way of identifying this rather secretive thrush. 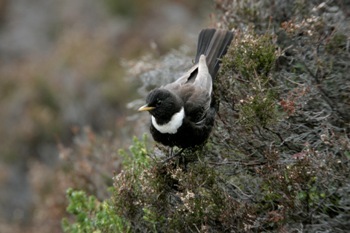 The first clue to a Ring Ouzel’s presence is often a stony chacking call or fluty song echoing round a valley.